I have a kitchen again! A proper kitchen, with bench space and cupboard space. A kitchen that is its own room and not a nook in the wall of another room. A proper kitchen that can now be filled with deliciousness. A kitchen which already has a ‘baking cupboard’ with four different types of flour in it. Hooray! 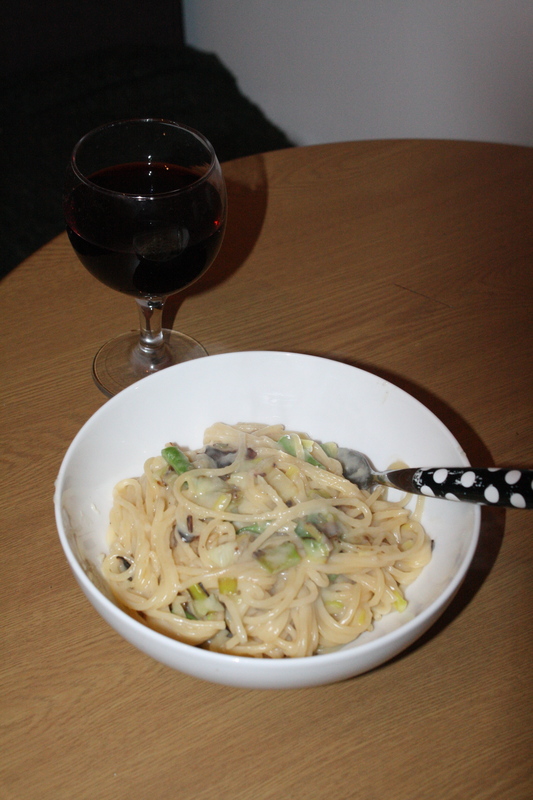 And so, in honour of the new kitchen, here is the first real creation that’s come from it (yes, I know we’ve been here for ten days now – but what with the moving and organising and everything I haven’t really had the time to devote to culinary creation.) 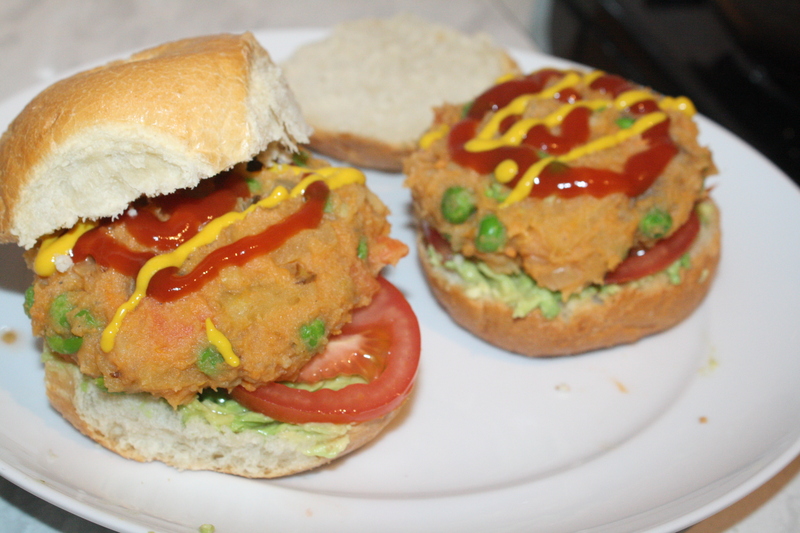 So, here it is: veggie burgers. 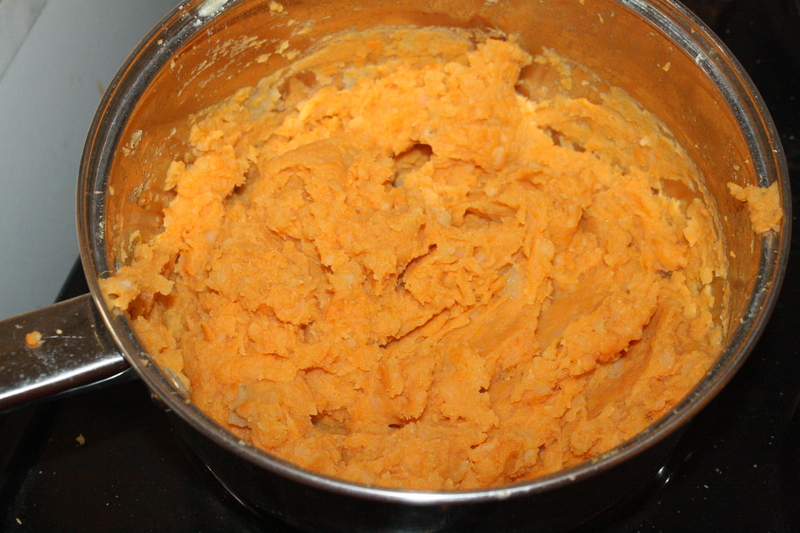 Peel all your veges, then roughly cut up and boil the potato and sweet potato, and put on to boil. When they’re done, mash and set aside. While they’re boiling, finely dice up your leek and onion and throw them into a frying pan with some oil. Keep an eye on them – you want them really nicely browned. While that’s going on dice up your other veggies (I actually did double, and set the other half aside for tomorrow night’s veggie soup!) and throw them in a pot to boil, with the peas. Obviously, you want them cooked though – but not over cooked. While that’s going on, your leek and onion mix should be done – tip it into the potato and sweet potato mash that you’ve set aside and keep your fry pan (no need to rinse) off the heat for a moment. 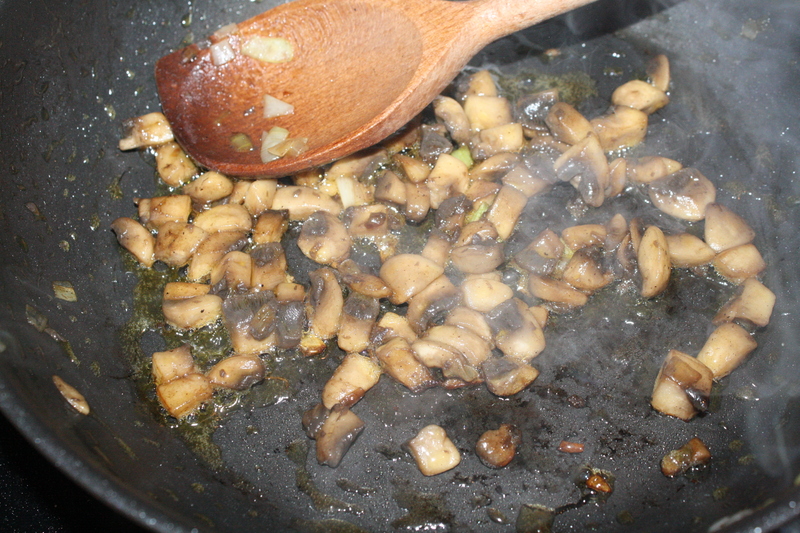 Peel and dice up your mushrooms, and throw them in the fry pan with a little bit more oil. Peel you say?!? If you don’t know how, there’s a handy tutorial at the end of the post. Now, how much you cook these is really up to you. I like them on the more well done side, but I know plenty of people who would quite happily throw them in the pan for 30 seconds and have them half-raw. Go with what you feel. 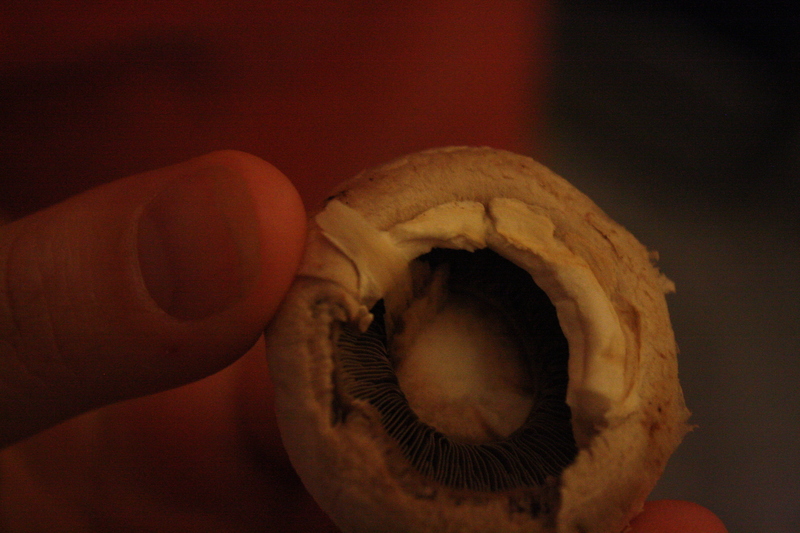 Once the mushies and veggies are done, tip them into the mash and stir it all together, with some salt and pepper. If you wanted to add some fresh herbs (rosemary would be my pick) do it here. I haven’t because S likes simple food, and at the moment my taste buds are so whacked out with baby-related weirdness that I don’t want to risk adding things and then not being able to eat them. There’s not need to be super precious about mixing – just get in there. 1. Break the stem off. 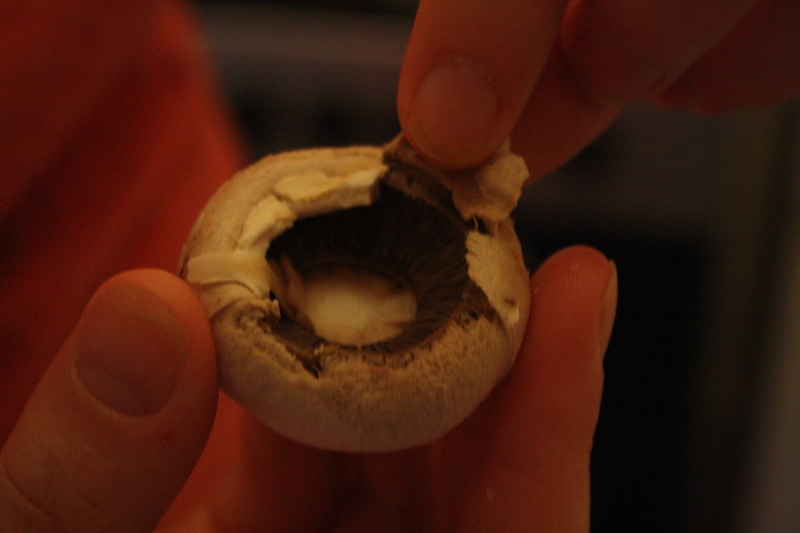 Move all the way around the lip, and hey presto – a perfectly peeled mushroom! This roast loaf will not win any prizes for beautiful food. But, it is tasty, easy and cruelty-free – which makes it good in my books! Let’s begin with the actual roast loaf. 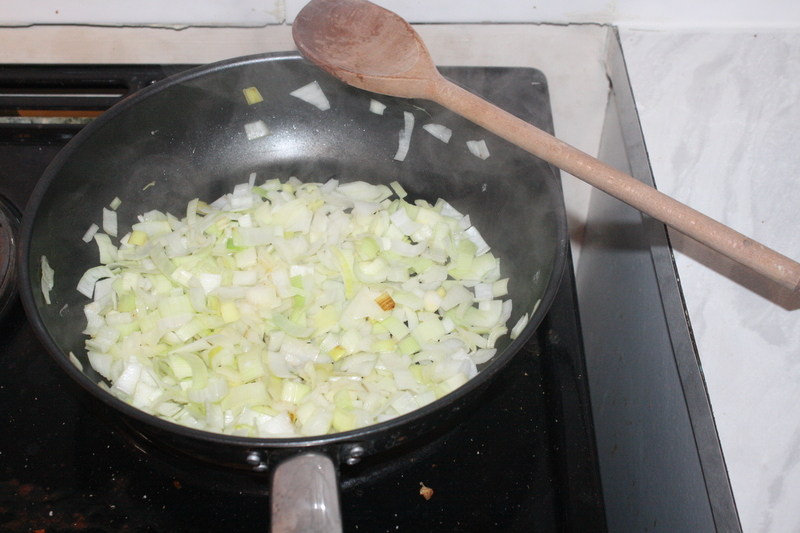 In a much-too-big saucepan and a small amount of oil, saute the shallots, leek and onions until translucent. Take off the heat and set aside. In a food processor, very quickly wizz up the chickpeas – you still want to have a fair amount of whole and half chickpeas. To this add the walnuts, parsley, and a small amount of the olive oil and wizz a bit more – keep adding oil until the mixture is very well combined. It’s not very important for all the chickpeas to be mushed up – having some whole chickpeas can be advantageous! 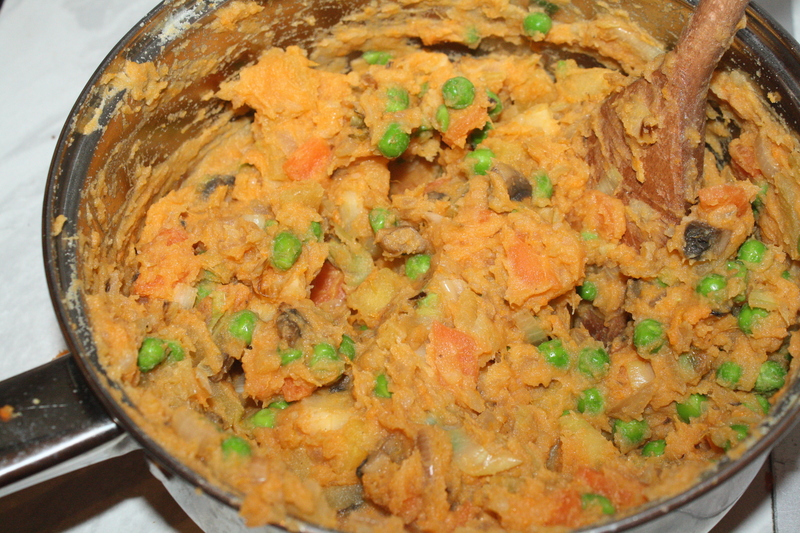 Add the vegetable stock to the onion mix, then add the chickpea-walnut mix and the nutritional yeast. Stir over a low heat until the two are well combined. Spoon the mix into a lined loaf-pan and bake in a 180 degree oven for about 45 minutes. If you like, you can take the roast loaf out at about 30 minutes and invert onto a flat baking tray to finish off the last 15 minutes. Doing this will have two results: first, it will crisp up the outside of the loaf and, second, you’ll have to wash up a baking tray on top of everything else. After you take the loaf out of the oven, invert (if you haven’t already) onto a serving plate and slice. It’s designed to be very moist and a bit ‘sloppy.’ The slices won’t stay in very nice little rectangles unless you are very careful when plating up. Now, the sauce! Well, to be honest, this is not exactly a sauce and more of a ‘topping’ but, it’s still good! 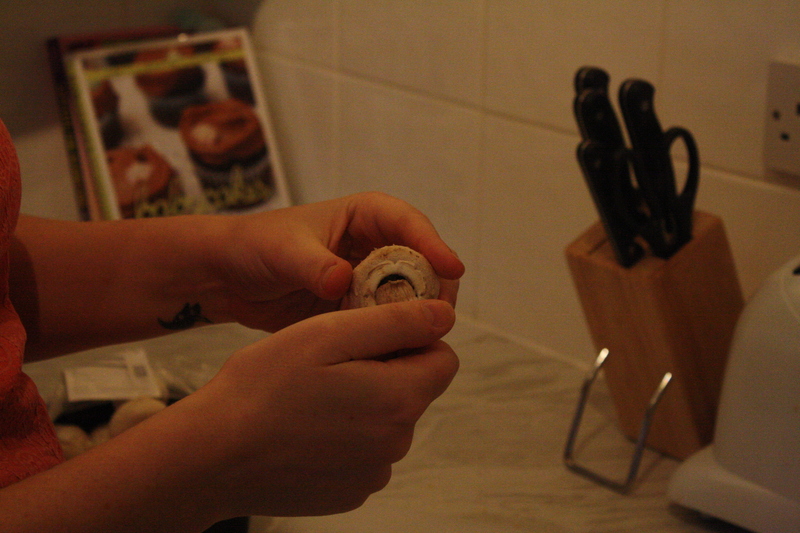 The easiest way to dice your leek is this: cut the leek in half lengthways and pull out the little center bit. You’ll then be able to flatten out the rest of the leek into ‘sheets’, cut lengthways into thirds and then cut those long strips into squares. To begin the sauce, melt a decent spoonful of Nuttelex on a fairly hot heat. Once melted, put the diced onion and leek into the saucepan and stir constantly for 2-3 minutes, remembering to scrape down the sides fairly regularly. Once the mix is well coated and starting to look translucent, add 1/4 cup of water and 2 teaspoons of stock powder (or 1/4 cup of pre-made vegetable stock). Put the mushroom in, turn the heat down a little bit and put a lid on the saucepan and let it simmer away, stiring or shaking occasionally. 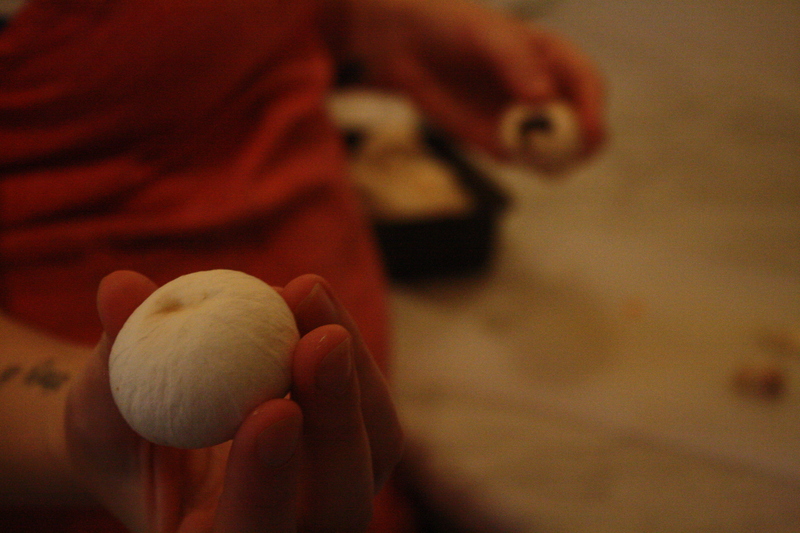 Once the mushroom has softened up take off the heat, and let rest with the lid still on for a few minutes. It will thicken up a bit, but not heaps. Serve either on top of or on the side of your roast loaf. The summer days are slipping away and the rain looks like it’s here to stay, and that only means one thing: putting all those lovely crispy salads and BBQ recipes away and pulling out warm, tasty, comforting winter food! 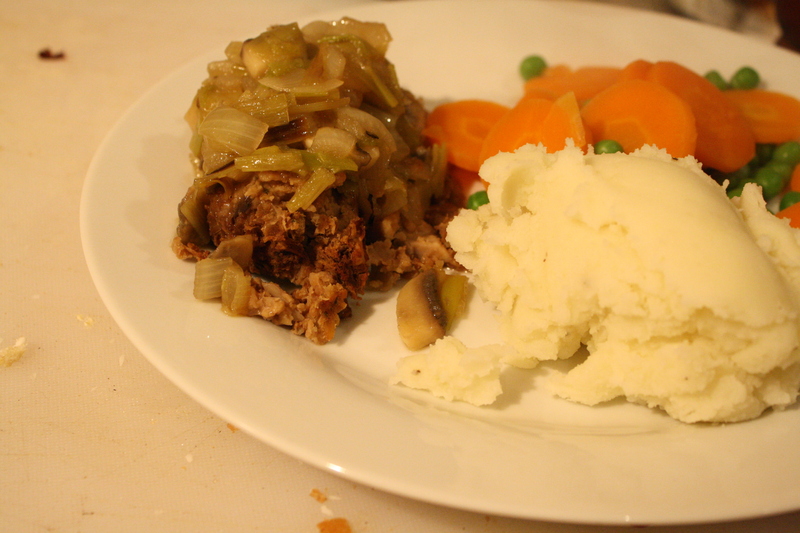 This one is a staple in my kitchen, even though I am not the hugest fan of faux-meat, S is still in that transition phase and, even so, he just likes the taste. For this dish I like to use the Fry’s faux-chicken strips. Firstly, I like Fry’s because S really likes the taste, and secondly, because all of their products are vegan and I think that’s worth supporting. 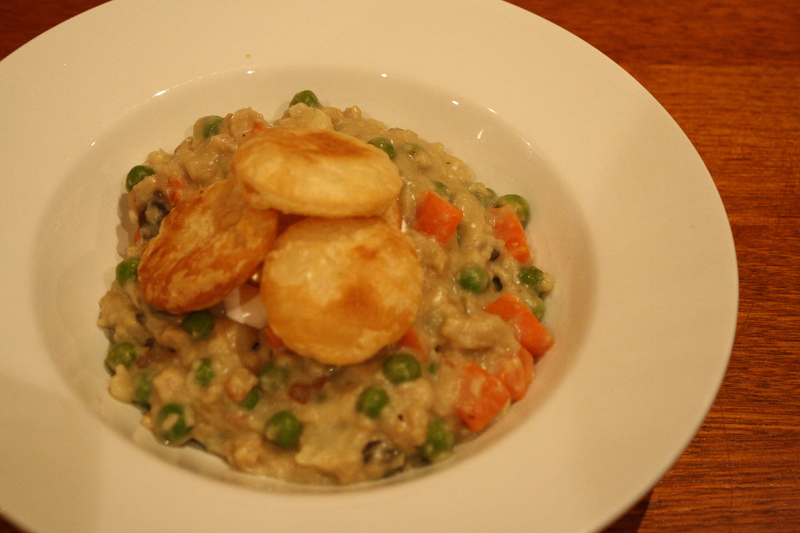 This stew is really good on it’s own but even better with pastry ‘biscuits’ or a lid. For the biscuits you’ll need a sheet of puff pastry. I use Borg’s, because it’s vegan and it says so in big bold letters right on the front (which is easy when S makes the trip to the supermarket!). You’ll also need a scone-press, a cookie-cutter or, failing all that, a knife. All you need to do is cut out circles of pastry, spray with olive oil or brush with some Nuttelex and pop them in the oven until their just starting to get some colour and then flip them over and back in until golden brown. sour cream substitute (like Tofutti Sour Supreme) to garnish, if desired. Start by browning off the leek and onion in the Nuttelex, in a large pot. When it looks almost done, put in the faux-chicken strips, 1/2 cup of vegetable stock and a pinch of salt, and the diced up carrots and let it simmer away for 5-6 minutes, to cook the carrots and the faux-chicken though. Next add the peas, nutritional yeast, the rest of the stock, 1/4 of a tub of Tofutti Better than Cream Cheese and stir until the cream cheese has dissolved. 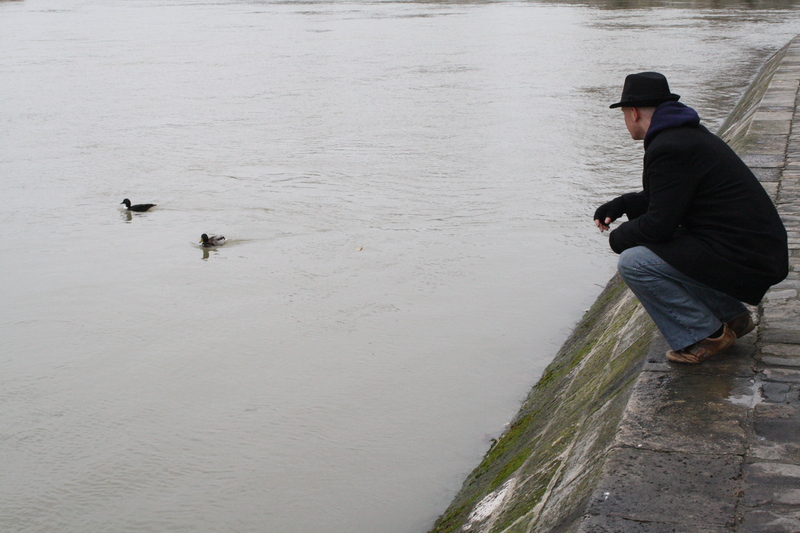 At this stage it should look like some insipid bath water – that’s okay! Now is the time to add the mushrooms, and to slowly add small piles of flour and more cream cheese and continually stir until the sauce begins to thicken up, obviously, stop when you get to a consistency you like. Add salt and pepper to taste. Top with a sour cream substitute if you like, and three or four pastry biscuits. This makes a pretty good pie filling, too. Last night was the great-tapas dinner party, which was a huge success! We had so, so much food and a fair amount of it didn’t even get assembled (I think that had something to do with the huge amount of wine that was consumed). 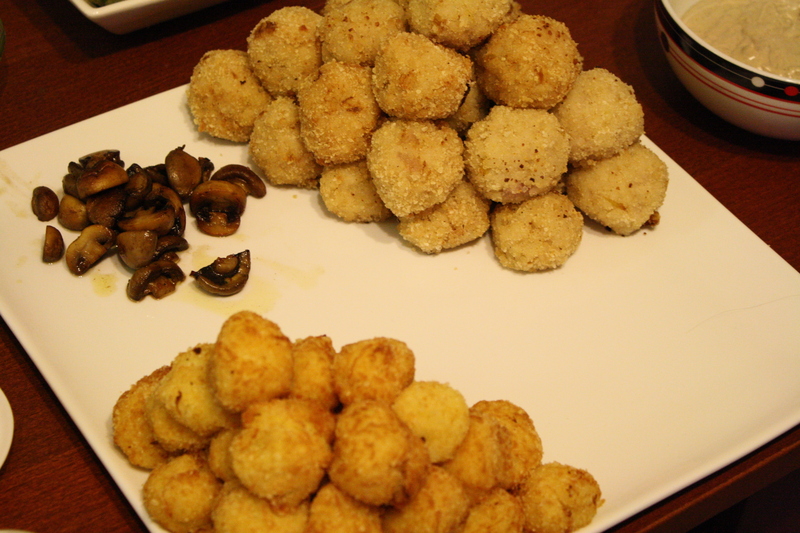 Two of the dishes that I offered into the mix were arancini (risotto balls) and leek and potato croquettes. Peel and cut up the potato into rough chunks and put on to steam (or boil). 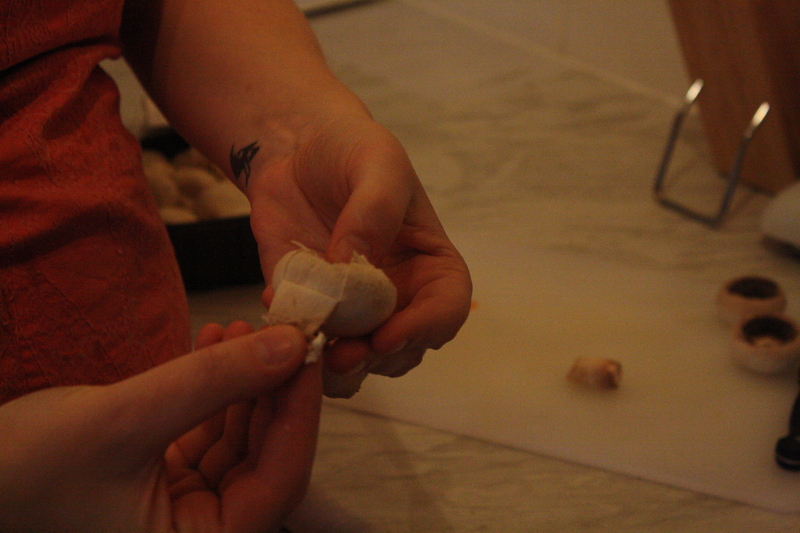 While that’s going on, cut up the white part of the leek into small squares. The easiest way to do this is to cut the leek in half lengthways, pull out the center and flatten the rest of the leek out into ‘sheets’ and cut into thirds lenghtways, then cut those long strips of leek into squares. In a small saucepan, melt a decent spoonful of Nuttelex. On a fairly hot heat, put the leek squares into the melted Nuttelex and stir constantly for 2-3 minutes. Be careful to scrape the sides down and get all the leek into the mix. Don’t let the leek brown off. Once all the leek is coated in Nuttelex, and are starting to look translucent, turn the heat right down, add the water and briefly stir around. Leave on the head, stirring or shaking intermittently, for about seven minutes. Once it’s down, take off the heat and set aside. Mash the potatoes. Do this however you like to mash potato. My new method is in a food processor, with the plastic ‘S’ blade. The good thing about ‘mashing’ like this is it creates smooth, creamy potato without any additives – so because it’s not laden with Nuttelex it’s a little healthier. 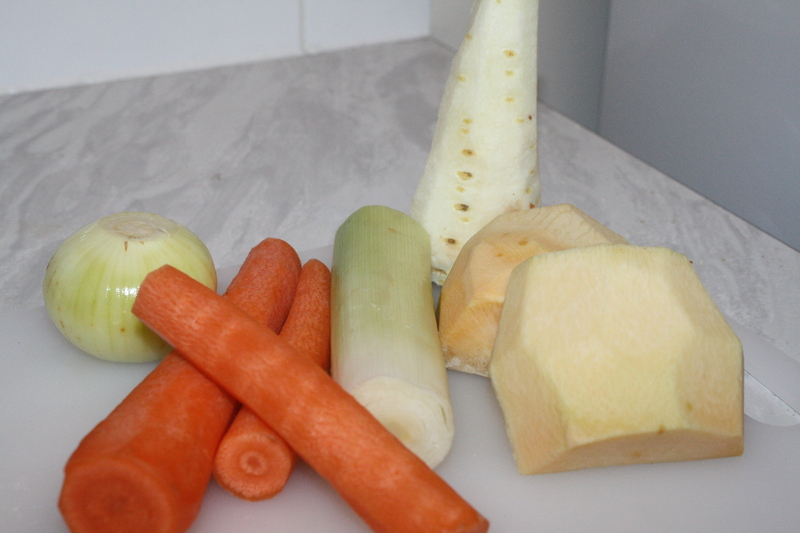 Combine the potatoes and the leek and stir until the leek is evenly distributed through the potato. If you’ve done your potato in the food processor, you can just throw the leek in and give it another small wizz around. Spread your crumbs onto a plate and, either using a spoon or your hands, roll your potato and leek mix into little balls, and then in the crumbs. Once you’re all ready to go, heat up the oil in a medium sized saucepan. If you’ve got a candy thermometer it can be handy to use it, and keep an eye on the temperature. Your oil should be between 175 and 190 degrees c. Fry the potato balls a few at a time until the outside is crispy and brown, rest them on some paper towel. You can serve these either hot or cold – they’re really good with some fresh homemade salsa, and (as seems to be my constant suggestion) a glass of a big, bold, or slightly spicy red wine.